Flyers fans really showed up Saturday night for an unforgettable outdoor game. 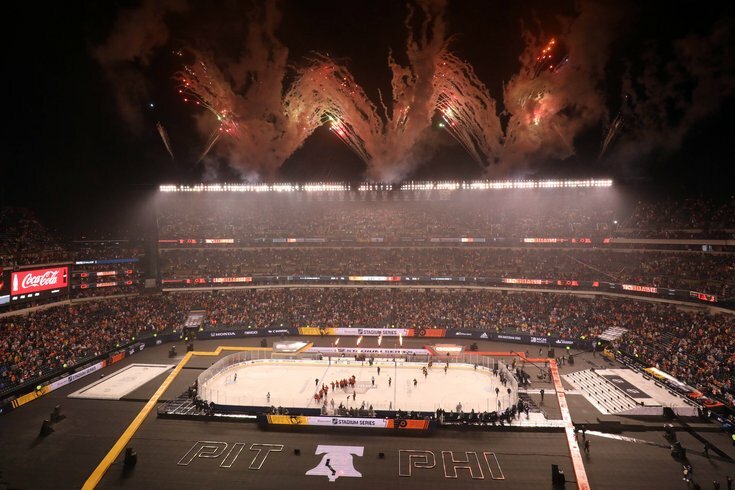 The best story to come out of the spectacle the National Hockey League put on at Lincoln Financial Field last Saturday night wasn’t the Flyers victory, the great comeback, Sidney Crosby’s loss, the weather, or even the mascot swinging in from the heavens. The best story was a truly Philadelphia sports tale of a fan base that is second to none in the country. What they're saying: Did the Flyers get enough in return for Wayne Simmonds? Although the city of Detroit has claimed the nickname “Hockeytown,” there has been plenty of evidence over the years that Philadelphia should have that title as fans continue to pour into venues season after season, although the Flyers haven’t won the Cup in a couple of generations. However, this was more than just hockey fans at the Linc. This was a broad base of Philadelphia sports fans who filled the Linc with more than 69,000 fans on a rainy Saturday night. It should be noted that the Flyers have basically scuffled through the season, playing so poorly at the start of the season that the general manager and coach were both fired. There is also the lingering story of injured and ineffective goaltending that has forced the team to use seven goalies this season, with a record-setting eighth waiting to be used when Cam Talbot makes his first appearance. In spite of all that background, the Linc was filled from top to bottom on a day when the weather was threatening from dawn right through game time. Not even the threat of a drenching rain – and the bizarre possibility or even probability that the game could be abandoned after two periods affected attendance. Even before gameday, there was the mere number of tickets sold for a team that was a disappointment through most of the season. Despite all of that, and despite the usual premium prices for a special event, the fans bought the tickets. Then again, what else would you expect from the city of Philadelphia and its sports fans? Think back to the NFL draft when the city of Philadelphia put on a show that is now the measuring stick for every future draft – and the knowledge that nobody can match Philly. No matter what the event, from the NFL draft, to All Star games, to college events, you can count on the fans of Philadelphia to provide a background of passion and entertainment. Networks might not be able to guarantee that the Flyers, Eagles, Sixers or Phillies will provide the drama, but they know the fans will bring the energy – even if it makes the home side uncomfortable. It was a remarkable night in south Philadelphia, and it ended with a sonic boom when Claude Giroux scored in overtime to complete an amazing third-period comeback. At its end, the fans were soaking wet as the rain had reached its drenching maximum and celebrated as Crosby and the Penguins lost a point and the Flyers postseason hopes were kept afloat – if only barely. The other important part of the evening was the stark difference between winning and losing. Imagine that the Flyers had lost the game, even in overtime. If that were the case, fans would have left cold, wet and miserable that Crosby’s Penguins had once again beaten the Flyers. There also would have been the misery of seeing another goal escape a Flyers goalie as the Penguins third goal skipped off Brian Elliott’s glove. There was also the looming background story of first-year goalie Carter Hart, who was first overlooked as the game is starting goalie, and a day later scratched due to injury. Going into the game there was much angst that the Flyers were not going to use the biggest story of the season as Hart saved the season with his historically fast start, but stumbled in his previous two starts when he was yanked from games early. Fans were truly upset when Flyers coach Scott Gordon announced his decision to start Elliott over Hart, incensed that they were paying big money to see this special event, and they were not getting to see the star they paid to see. Matters got even murkier the next day when Hart was placed on the injured list. It seemed like a bad cover up, until Hart admitted he has been trying to play though a lower body injury. It became more obvious that Hart really wanted to play in the game, even having a custom mask featuring both Carson Wentz and Nick Foles. In the end, Hart was unavailable and will still have a recovery period before returning for the team’s last month. However, the Flyers finished the evening with a flourish, chasing the Penguins out of the city with a great finish. The lasting memories are of Giroux with his arms extended in celebration at the end of his 800th game, Elliott making two huge overtime saves, and fan favorite Wayne Simmonds making some big hits in what most people correctly realized was his last game with the Flyers. It was quite a night for the Flyers, quite a night for Giroux, quite a night for the National Hockey League and the sport of hockey. However, more than anything else, it was once again quite a night and proud moment for the fans of Philadelphia.